Perhaps a drought warning should be issued in the UK, because whilst the rest of the world appears to be diving into their Scrooge McDuck money banks filled with Sixguns – Wave 2 of Siege is almost entirely absent from our online stores and shelves. 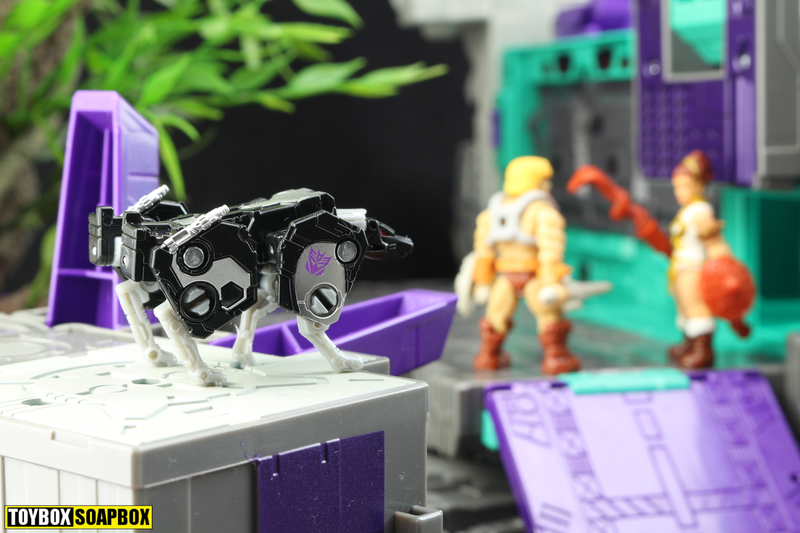 I say almost, because recently the first signs of that dry spell ending appeared, with the Micromaster Rescue Patrol and Decepticon tapes (Laserbeak and Ravage) starting to pop up as in stock on Kapow and various other UK online import retailers. Can a single Ritz cracker stave off hunger for a little while longer? Just until Soundwave and Ironhide convince the UK equivalent of “Nothing to Declare” that they aren’t entering the country to illegally work in a sock making factory? 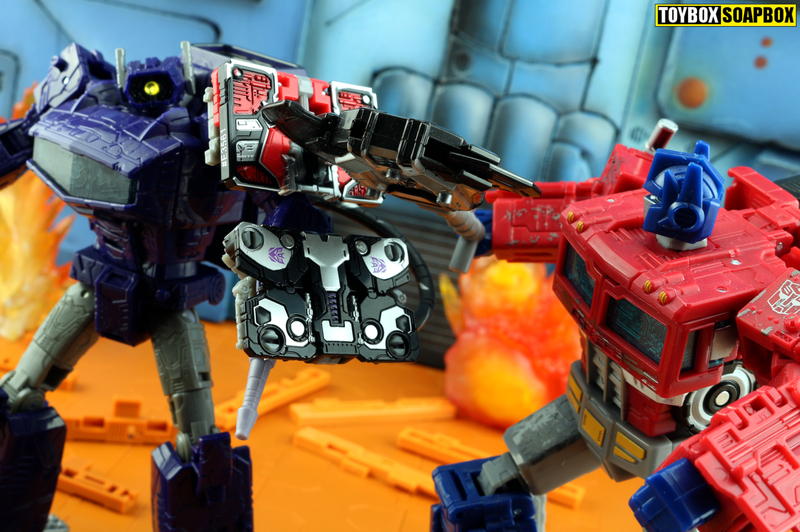 Read on for the Transformers Siege Laserbeak and Ravage review. Rarely in my life have I been so happy to see the return of mini rectangular slabs. For young, miniature Liam, the original microcassettes were such a memorable part of Generation One that to see them make a rare reappearance in an era where music no longer possesses a physical form, makes me cheer louder than the annual Derby County play off bottle job. There’s something special about the G1 tapes that sets them apart from other toys. Were you to say Transformers to most 80’s kids, Optimus Prime would be the first response but it would be swiftly followed by memories of Soundwave and his minute minions. Playing such prominent roles in every form of media, even surviving the Sunbow extermination squad of 1986, is a factor, but there’s something about them as toys that captures the imagination and manages to showcase the play potential in a way only a select few others do. A certain 80’sness is built into them that falls over itself into charm at their ability to endure in spite of the redundant nature of their alternate modes. It’s never mattered whether the tapes are updated into forms that blend better with the modern era. They just work across all generations. With this being Siege and it being set on Cybertron before The Transformers had ever nipped to Earth to begin their sightseeing tour of Volcanos that was tragically cut short at the first stop, they can’t actually be microcassettes. I mean we know that’s what the designers intentions were when they developed them, but as is required by Hasbronian law they have to possess some Cybertronian function, and for this iteration that manifests as – “Sonicsurge Drone Armor”. No, seriously. Double seriously in fact. Apologetic shields they may be, but if you run across a figure that has a 5mm socket on it’s waist then yes, you can indeed employ Ravage or Laserbeak as Cybertronian hula skirts. I completely get the need to call them something other than micro cassettes because modern kids probably have no idea what a microcassette is, but guys, you ain’t fooling anyone with this armour lark. Why not make them Minidiscs – that’s still a thing the kids are down with, right? The Siege Micromasters all have the ability to combine, but the two tapes ignore that gimmick. 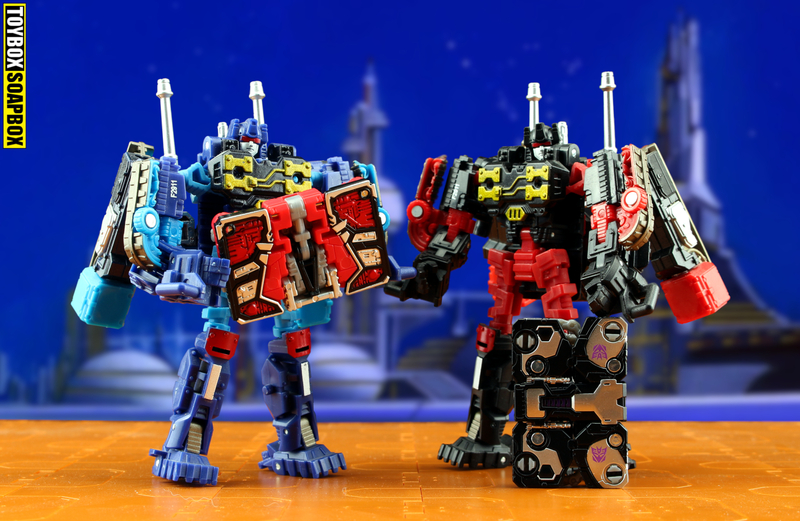 Naturally the focus is instead squarely on their ability to store in the chest of the Voyager class Soundwave that is also available as part of Wave 2. With the death of the old boombox, everybody seems to have weird magical cubes known as “bluetooth speakers” or whatever these days, the tapes are now deployed from his all new, all different “dropship” mode which does look like a boombox strecteched out. As a backdoor way for Saint John Warden and pals to get the tape gimmick into a modern toyline more successfully than the great Data Disc depression of 2012, I fully endorse it though. As food for the imagination it works too as I’ve become quite fond of this image of Soundwave zooming into the hot zone, then ejecting Laserbeak in order ensure it’s safe before landing and Ravage disembarks to skulk away into the shadows. Playing in his internal tape deck throughout would be Danger Zone by Kenny Loggins, obviously. That’s the true beauty of toys, it isn’t being lathered in paint, or an adherence to an image on a screen – it’s the ability to inspire your imagination before you’ve even gotten them into your hands. Equally, that is also the beauty of rum, but some might say that’s not really appropriate. 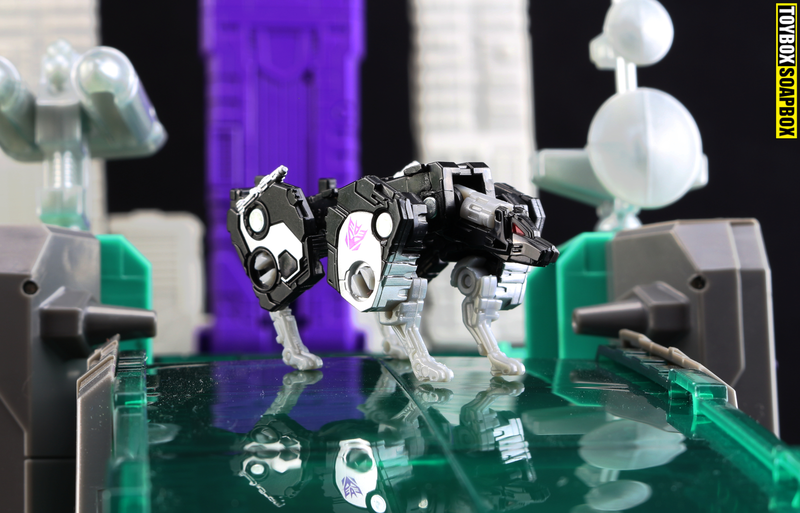 Each cassette has the basic transformation scheme you’d expect of a toy that’s so small in stature, but Laserbeak has a slightly simpler process than Ravage. Flip the wings out, rotate his thruster block up, extend the neck, fold the feet down and you have yourself a tiny robot condor that can’t possibly be a condor because it’s from Cybertron and predates the recorded existence of condors by over a million years. If the intended effect is to fit the idea of rapid troop deployment, then this transformation is bang on point to that as well it is the spirit of the original G1 toy. A lot of grumbling has occurred over cartoon accuracy on both sides (*insert The Rock rolling his eyes gif here*) but other than the yellow visor, this toy doesn’t take much from the Cybertronian mode Laserbeak that appeared in the opening episodes of the cartoon. More than anything Siege whips up a beautiful, idealised appearance for Laserbeak that combines elements of the cartoon with the vintage toy and then covers them with a few unique touches to give it that Generations veneer. For something so small and basic, there is also a lot of paint that is mainly used to pick out his vintage toy detailing on the wings. It’s lovely bird mode with very little to gripe about, but if you really did want something to chastise, then the manufacturing codes stamped onto each wing are not the most attractive look. Fortunately I can rationalise them as Laserbeak waking up with random tattoos after being out on a bender one night in Hong Kong, with Gazza and Danny Baker. Laserbeak is missing his signature laser guns, but his thruster pack feels no less substantial or lacking. Hasbro and Takara’s designers have engineered it to be part of the transformation which is something previously seen in Masterpiece and to a less interesting extent on the Combiner Wars version of Laserbeak. 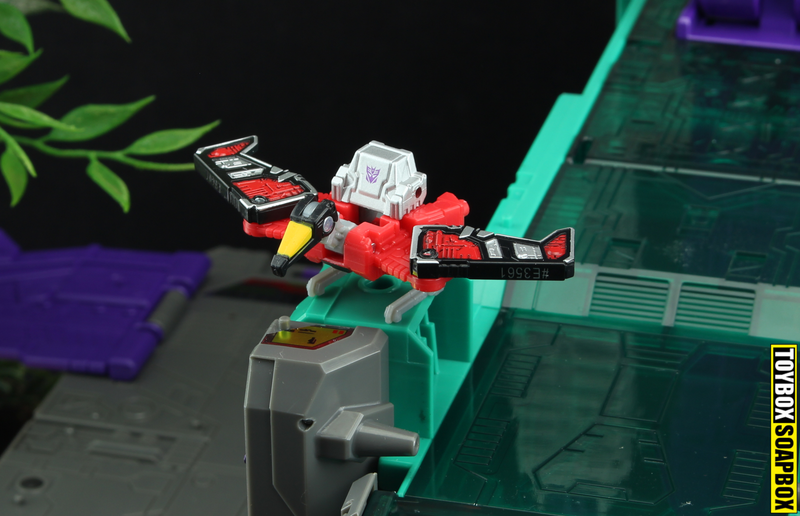 Owing to the “Sonicsurge Armour” moniker, a peg on Laserbeak’s underside allows him to connect to any 5mm port, meaning on figures like Siege Megatron – he can perch on their forearms. He can keep returning and not failing Megatron, unlike some of his other warriors. Unfurling Ravages legs and making sure they can move past each other is a bit like one of those spinning puzzles from The Crystal Maze, and can make the transformation a bit of a faff, but once you get the hang of it the process is quick and straightforward. Once transformed, your new robot kitty is hella chunky. More in tune with the lasagna stuffing Garfield, than the stealthy feline stalker we tend to think – but that’s all good. Siege Ravage may not exude in guile, but it seems to take some cues from the Ravage we see eject spectacularly from Soundwave’s chest in the Bumblebee movie. He’s not perfect but it would be very boring if every single new version focused its efforts on the exact same, sleek panther mode. Whether intentional or not, his stodgy, four legged feline tank like form just wants to get back in the gym ready for leg day. His upper arms look like Stuart Pearce’s thighs! Ravage’s vintage toy came equipped with optional, silver missile accessories but Siege follows the trend of most of Ravage’s recent toys by making them a part of the transformation. As a result they end up super thin and maybe more like miniguns than honking great rockets, and they add to the weird proportions of this toy. The silver paint used across the figure is really nice, with a dash of purple picking out what looks to be spinal like detailing in a lovely little touch. Each leg is individually poseable but due to the limitations of the scale it doesn’t allow for much in the way of dynamic posing. That being said you can move the front legs outwards so he can be posed with his legs splayed like a drunken Dancing On Ice contestant. Unlike Laserbeak, his 5mm peg is built into his neck so serves little purpose in this mode beyond allowing you to fudge an assblasting Targetmaster mode if you really wanted to. 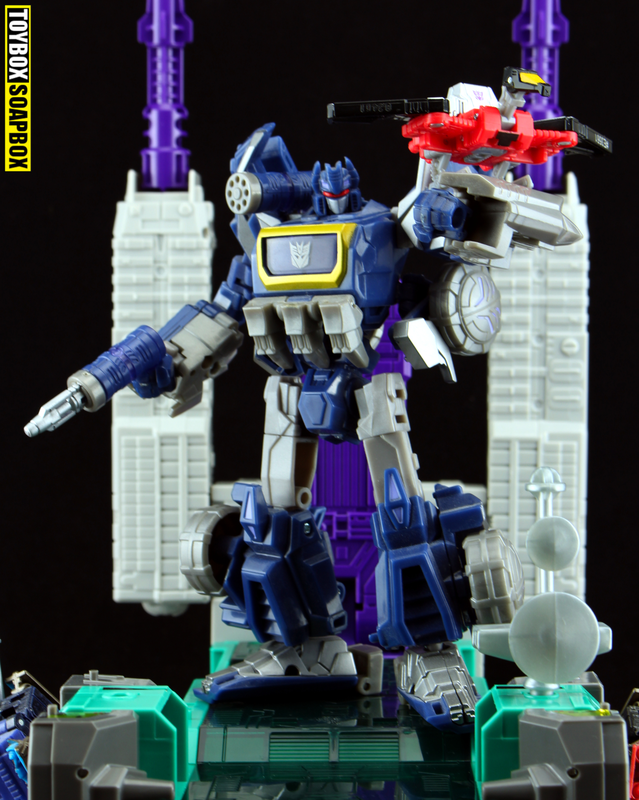 Laserbeak and Ravage always come with the expectation of limited articulation and features, due to their size and the acceptance that their main appeal is the connectivity with papa Soundwave. Due to who and what they are, and their roles as spies, the cassettes themselves don’t have to do a great deal to be successful toys. That being said, for what amounts to a tenner for the pair, these guys are still a significant improvement over those horrendous “data discs” (spins rounds as FOC Steeljaw explodes, untouched, knocking over a bunch of other toys, for the 5000th time) and they also manage to still look way better than their much larger Combiner Wars counterparts. Value wise they are outstanding and even though Laserbeak is by far the better realised figure in the set, Ravage drags himself along close behind, slightly out of breath and needing a can of Monster in order to keep going. But he does keep going, and I cannot wait to pair them up with Soundwave. Despite Siege apparently being cut short, one of the big positives of the current Transformers brand team is that they still return to previous concepts in future lines to fill out gaps. 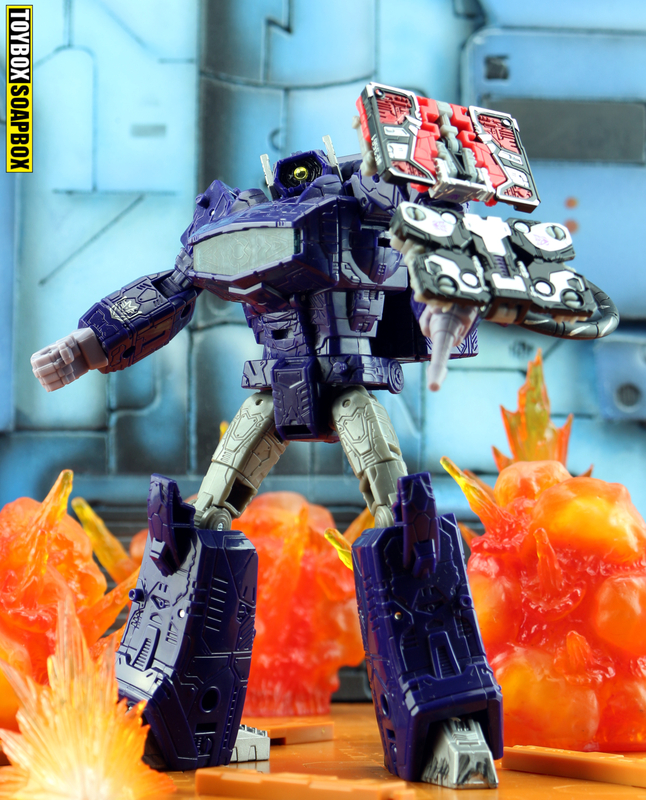 So hopefully even if we don’t see them before Siege’s demise, there is still a time and a place for a new Ratbat. 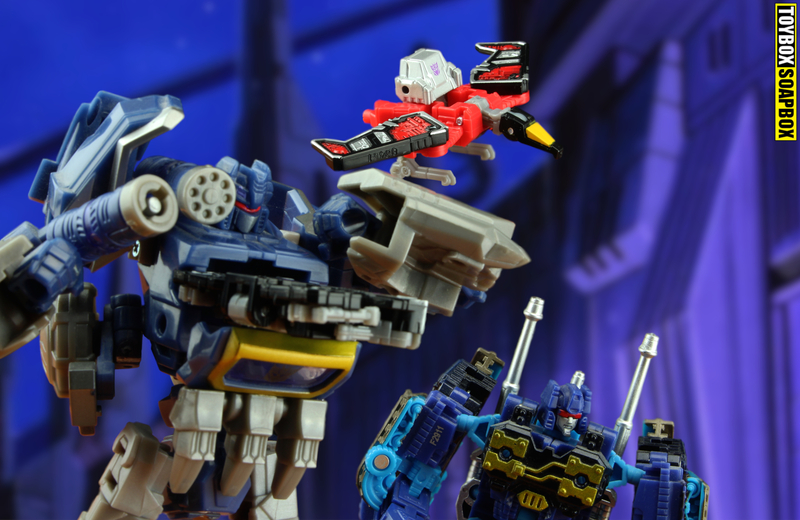 You can pick up Siege Laserbeak and Ravage bundled with the Wave 2 Micromaster Rescue Patrol from Kapow Toys right now. ← Previous Previous post: SHORYUKEN! The Loyal Subjects Action Vinyl RYU!